An article on the 1999 murder of a Swedish syndicalist by fascists. On October 23, up to 40,000 people across Sweden joined memorial demonstrations against the October 12 killing of Bjorn Soderberg by fascist thugs. The demonstrations, including 20,000 in the capital Stockholm, were the largest anti-fascist protests in Sweden since the end of World War II. The eve of the demonstrations was marked by an explosion in the Swedish town of Gavle, birthplace of Joe Hill, the American Industrial Workers of the World (the “Wobblies”) activist. This attempt at intimidation failed, and 2,000 people attended the Gavle demonstration. 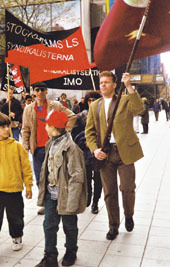 Bjorn Soderberg, 41, was a long-standing activist in the trade union Sveriges Arbetates Centralorganisation (SAC). He was shot three times when he answered the door of his flat in the Stockholm suburb of Satra. One bullet went through his head. Soderberg's killing is the latest in a line of right wing murders and attempted murders in Sweden. Since 1995, there have been 12 murders of immigrants, including a 14-year old boy; the killings of several gays and anti-fascist activists can also be traced to the far right. In January 1998, a letter bomb containing two cubes of dynamite, posted by the British fascist group Combat 18, was intercepted en route to the Swedish Justice Minister Laila Freivald. Last June, a journalist who documented the Swedish white supremacist movement was seriously injured when his car was blown up in Stockholm. Both he and his eight-year-old son were blown several metres through the air; the boy's eyes were lacerated by shards of glass. Also last year, two police officers were killed during a fascist bank robbery. For years, Sweden's immigrant population has been subjected almost daily to street violence, arson attacks, racist abuse and false imprisonment. This reached a high point in the early 1990s, after the Swedish government tightened its immigration policy. There were, for example, 79 arson attacks on asylum hostels in 1992, when official political discussion was dominated by hysteria over immigration. There have also been a series of killings of gay people in the town of Gothenburg. This is not all the work of organised fascist groups. The so-called "Laser Man" shootings in 1993 were carried out by a single right-wing individual. Studies have also shown that much of the violence aimed at asylum hostels was the work of drunken local xenophobes and backward youth, encouraged by the tone of official politics to blame asylum-seekers for the growing unemployment of the early 90s. The turn to violence by a small numbers of fascists coincides with their weak electoral performances and the outbreak of internal feuding. The latest killings, and the discovery of a target list of 1,000 people, some of whom hold high positions in the Swedish state, has forced a marked change of attitude from leading Swedish commentators. Last month, the editors of Sweden's four largest newspapers published an open letter calling on the state to take a tougher line with neo-Nazis. The editors of Aftonbladet, Expressen, Svenska Dagbladet, and Dagens Nyeter called for "society to strike back" against a terrorist movement that has "come out of the shadows". The open letter admits the anti-immigrant bias of their previous coverage, and confesses that reporting neo-Nazi violence as "the ignorance and follies of youth" was a mistake.